I know it’s November, and it’s a funny time of year to be introducing a reading challenge, but this is a post I’ve been meaning to write for some time now. Back in January, I set myself a challenge designed to get me to read more. 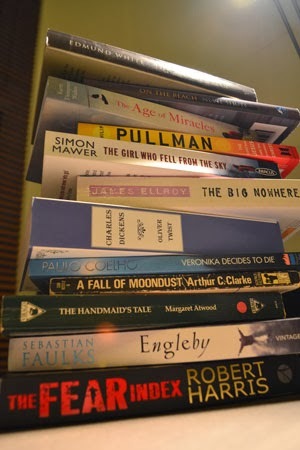 Having become thoroughly fed up with my lack of reading over the previous few years, I decided to do something about it and set myself a challenge – to read 12 new books by the end of the year. Now, I know a lot of you fellow book lovers will scoff at this measly total. “12 books? I read that in a month!” I hear you cry. For some bloggers I know, that’s pretty much what you get through in a week, let alone a year. But working from home for the last two years has meant that precious reading time is no longer available. I have a lot of other interests aside from reading, so without that commute, my reading rate plummeted to the extent that I finished just two books in 2012. An appalling record for a bibliophile, and something had to change. Without the prospect of a daily commute starting again any time soon, I knew that I would have to make changes in my lifestyle somewhere, so inspired by the many reading challenges I read about in the blogosphere, I decided to set myself a simple, but hopefully achievable challenge. I didn’t want to set a theme. I have an eclectic taste in books, and wanted to dip into as many genres and styles of writing as possible. I had no real plan, either, and simply pulled a book off the shelf that took my fancy each time I finished one. I wanted to read classics alongside contemporary, sci-fi and lit-fic, light-hearted and heavy. I only bought two new novels this year, too, which means I read more than I bought for once! I was also helped by starting a new job which saw me travelling for nearly two hours to and from work once or twice a week, and with the prospect of a new full time job starting soon, I can look forward to even more reading/travelling time in 2014. I can’t wait!